The construction of embankments (circa 400m), flood defence walls/ barriers (circa 200m), road/track raising (circa 250m2) and re-grading of existing garden (circa 1,650m2) at Brick Island and Jolly Mariner apartments as part of the Athlone Flood Alleviation Scheme. No protected structures listed in the Record of Protected Structures (RPS) in the Athlone Town Development Plan 2014-2020 are in proximity to the proposed works. The development has been the subject of a Screening for Appropriate Assessment in accordance with Article 6(3) of the EU Habitats Directive (Directive 92/43/EEC) and the Planning and Development Act 2000 as amended. 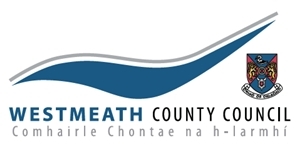 Plans and particulars of this development are available for inspection or purchase at a fee not exceeding the reasonable cost of making a copy, during office hours (9.00am to 4.00pm) at the Westmeath County Council, Athlone Municipal District, Athlone Civic Centre, Athlone, N37 P2T5 excluding weekends and Bank Holidays commencing on Wednesday 22nd November 2017 up to and including Thursday 21st December 2017. The plans are also available for inspection on www.westmeathcoco.ie. Submissions or observations with respect to this development in the context of proper planning development of the area should be made to Westmeath County Council, Athlone Municipal District,Athlone Civic Centre, Athlone, N37 P2T5 on or before 4.00pm on Friday 12th January 2018.